CMC Vellore Entrance Exam Admit Card 2019 – Candidates can download the hall ticket / admit card online using CMC Vellore Application ID and Date of Birth (as a password) / password. Hall Tickets will available for download on the CMC website. The Christian Medical College will release the of CMC Vellore entrance exam admit card 2019 for Group A and Group B and PG Diploma Course. You can read this article for the CMC Vellore Admit Card 2019. Hall tickets for Computer Based Entrance Test (Step-1) will be available for download from official website. 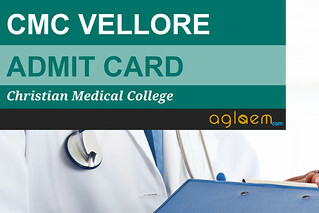 Candidates who will apply for Group A (MBBS, BSc Nursing, Allied Health Sciences (AHS ) Degree courses) and Group B (Diploma Nursing, AHS Diploma courses, MPH and MSc courses), various PG Diploma and PG Diploma in Clinical Pastoral Counselling Course can download the CMC Vellore Admit Card 2019 using the link which is provided below. If a candidate is unable to download the Hall Ticket from the website, they are advised to inform the Registrar immediately. Go to the log in page of CMC Vellore Entrance Exam using the link given above. Enter log in details – Application ID, DOB. Go to download admit card tab. Connect your PC to a printer and insert a plain white sheet. If a candidate is unable to download the Hall Ticket from the website, they are advised to inform The Registrar immediately, giving the candidate’s name, application number, date of birth, full address, and centre opted for writing the Entrance Test, by sending an email to [email protected] or by telephone, post or fax (0416 – 2262788/2262268). Hall ticket number and address of the centre will be intimated if the candidate’s application is complete in all aspects. There will be a Computer Based Test for all the Group A & B Courses as per schedule given above. The entrance test for the Group A degree courses other than MBBS will consist of Aptitude Assessment test (as above) followed by tests on Physics, Chemistry & Biology. Group B diploma courses with Science paper will have multiple choice questions in Physics, Chemistry & Biology, in addition to General Ability with emphasis on Speed and Accuracy, and a few questions on issues of current topical interest. The General Paper (Non Science) for Group B will consist of multiple choice questions of a general nature, including very basic science, general knowledge, current awareness and general ability. All the tests will be conducted in English. Special tests and Interviews for selection to the various courses will be held at Vellore as per the schedule. At the time of the Step-2 for BSc Nursing, Diploma Nursing and Allied Health Science degree courses, Christian students who have applied under the sponsored category will be given a test on Bible Knowledge (multiple choice questions). At the time of registration for Step-2, original certificates should be produced for verification. Attested photocopies are admissible at this stage but not when registering for admission to the respective courses. when will be cmc mbbs xam? when will be the cmc mbbs xam? At the end of July If you are in a merit list .All the best.